Back of the Head: Smallville: Season 11 #19 - "Detective"
SUPERMAN! LOIS LANE! THE BATMAN! THE PRANKSTER! MR. FREEZE! JOE CHILL! THE TOYMAN! Contrary to popular belief, Superman has weaknesses. Kryptonite, obviously. Magic. Lack of yellow sun radiation or exposure to red sun radiation. If you have any or all of those items, you can beat Superman. Theoretically, you can even kill him. But even with such, one needs to exploit what is perhaps Superman's greatest weakness: Overconfidence. So, Toyman's theory is that Prankster has been trying to visit him in Stryker's to gain his approval. Toyman and Prankster were both R&D science nerds for Oliver Queen before Toyman jumped ship to work for Luthorcorp. I don't suppose he had to go very far after Queen Industries and Luthorcorp merged so that Queen did his business out of the Luthorcorp building. Toyman also believes that Prankster is "copycatting" him, which means he's using meteor rocks in whatever evil toys, er, pranks he's making. Actually, for a "prankster", The Prankster isn't doing a lot of pranking. He is doing a lot of shooting with guns. Back at the Suicide Slum not-so-safe-anymore-house of Joe Chill, it's time for action! And some jokes. And cold puns. But mostly action! The Batman and Superman are being shot at by The Prankster and Mr. Freeze. Hey, Mr. Freeze coming to kill Joe Chill, that's pretty cool. (I'm so sorry. Won't do that again.) 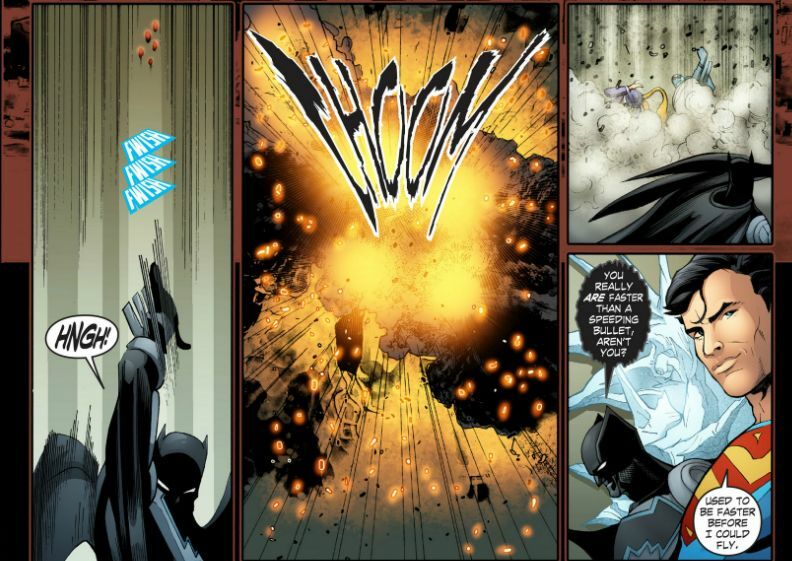 Superman is fast enough to move Chill out of the way of the bullets and freeze ray headed their way, while the Batman has plenty of things in his utility belt to make the walls and ceiling of the room explode. This buys Superman and Batman time to quip. Superman and Batman also have time to explain to each other that Mr. Freeze isn't normally a hitman and his freeze technology seems to have been given an upgrade by Prankster. Prankster also utilizes this time to helpfully explain to the World's Finest Team that he's now acting as a hitman to impress his Intergang bosses so they see him "as a worthy investment". Because, you know, he's the Prankster. I'd question why we hired the Prankster too, if I were Intergang. Okay, so, exposition is out of the way, back to fighting. 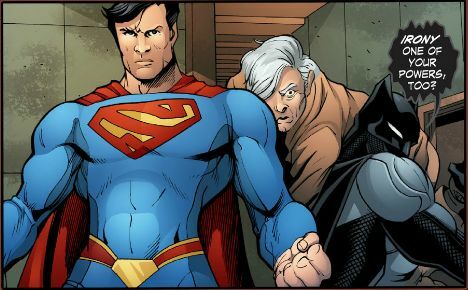 Superman orders Batman to get the man who murdered his mommy and daddy to safety lest he be murdered. Beautiful. Batman skedaddles to keep safe the very man whose greed and gunshots stole all sense from his life. Meanwhile, defying all rhyme or reason, it's the Prankster, not Mr. Freeze, who delivers a terrible cold pun about Mr. Freeze being in this for the "cold, hard cash" as Superman fights them off. Superman appreciates the pun even less than the freeze ray aimed at him. The Prankster fires off three of the meteor rock bullets Toyman alluded to in prison and they zip past the Man of Steel after Joe Chill. 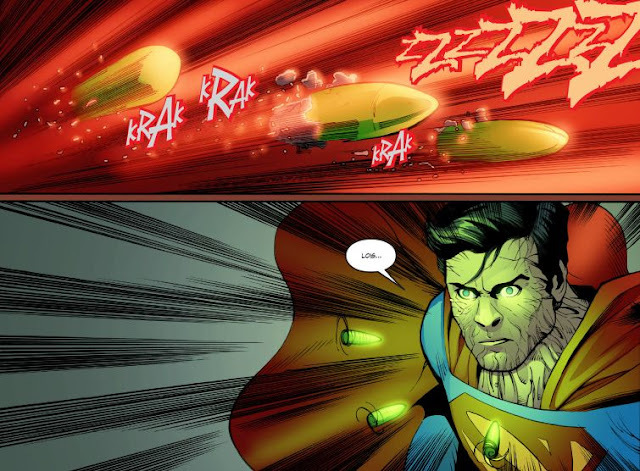 These bullets act a lot like Darkseid's Omega Effect beams. The Batman, probably secretly fuming about keeping Joe Chill from eating three Kryptonite powered bullets in the chest, uses even more fancy exploding things from his utility belt at the bullets, but the bullets keep on coming. So Batman pulls the same trick he once used on Vickie Vale in his 1989 movie and has Chill attach a Batline to his belt that zips him upwards while the Batman tries another doohickey from his belt and takes the brunt of the bullets exploding. Meanwhile, Superman thinks he has Prankster and Freeze well in hand. Which brings us back to what I said earlier about overconfidence. Superman has too much of it. When Prankster rearms his hand cannon and fires three more bullets at the Man of Steel, Superman assumes Heat Vision will solve the problem. But not this glowing, green, alien, radioactive problem. Uh oh. Is this the end for the Man of Steel? Yes, of course it is. 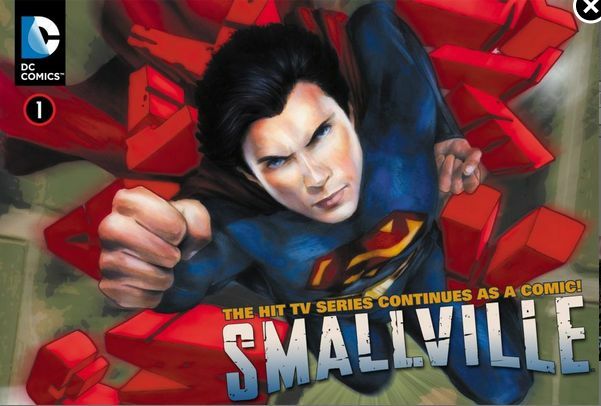 Cancel the rest of this series, Superman died in a room in Suicide Slum in issue 19 of Smallville: Season 11. Alas, there will be no tomorrow for the Man of Tomorrow. Also, cancel the next Batman movie, because Mr. 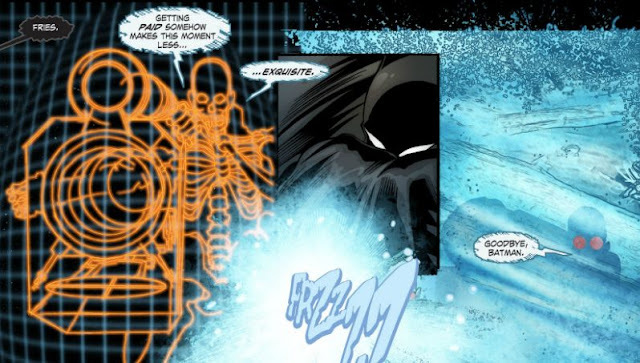 Freeze has just gotten revenge for the terrible Batman and Robin movie, as Freeze finds the Batman recovering from surviving the explosion and blasts him with his freeze ray. And Freeze still didn't use a cold pun! 1. Did superman just say that since he can fly he has gotten slower? How does that make any sense? 2. While i do like the smallville universe and how they are bringing the little things like winslow knowing clark is superman, i really hate how kryptonite vs Heat vision is still so erratic. Sometimes i can dissolve meteor rock, sometimes using it makes it reflect light and blind him, sometimes it turns into black meteor rock. And we know that it has the power of at least a mini nuke, so not being able to at the very least completely push the bullet away by force is ridiculous.